We’re wedding crazy at the moment on The Current! To conclude our ‘Wedding’ series, we’re sharing with you our favourite personalised cards! 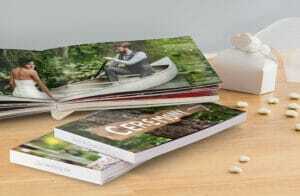 We’re here to show you how you can personalise your event from start to finish with Snapfish photo gifts and cards. 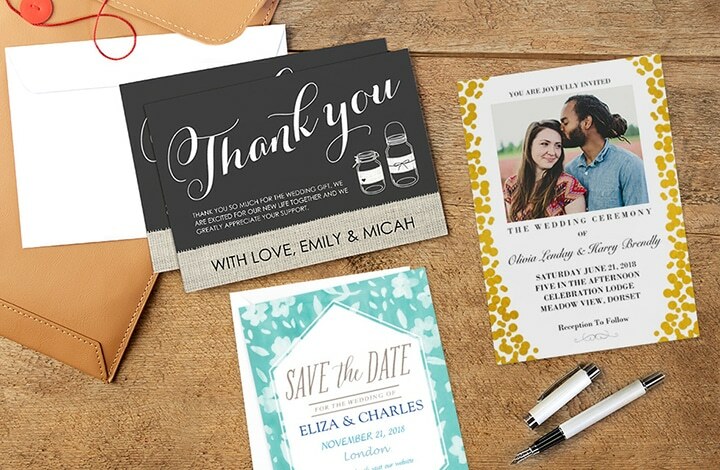 At Snapfish we have a variety of templates to help you get your message across for your wedding, whether that be a Save The Date card, Wedding Invites, Thank you cards, and more. With many different designs, colour and orientation options available, you’re sure to find something that meets your needs, quickly and easily. Or, you could simply upload your own design to one of our blank card layouts for the truly bespoke approach. 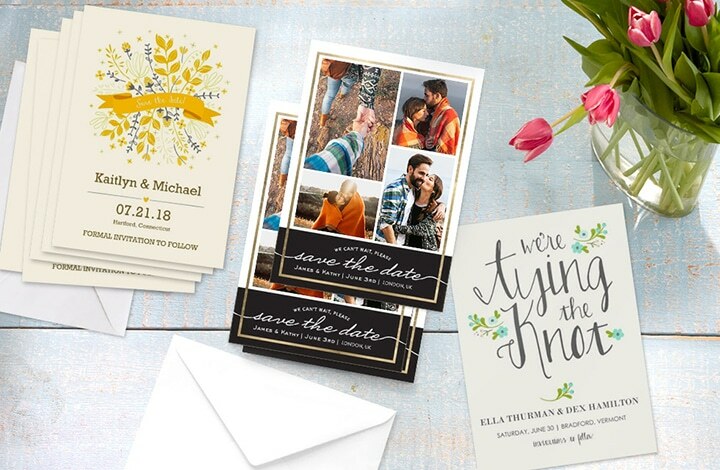 Save The Date cards normally should go out about six to eight months in advance of your wedding date to ensure your guests have time to save your special day in their calendars. 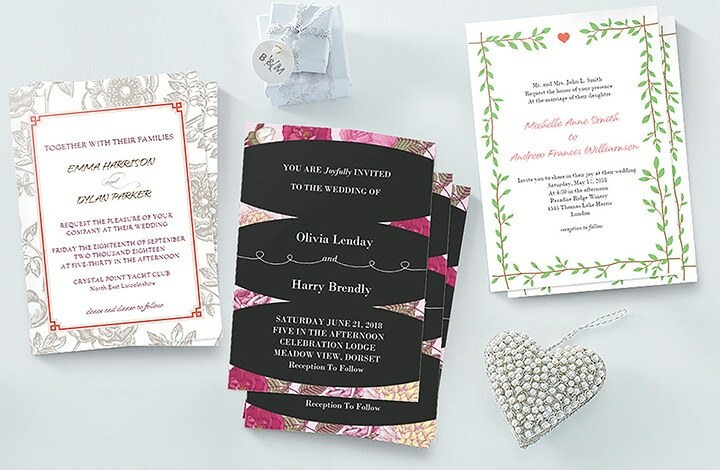 Cards start from £14.99 for a pack of 20 flat invites printed on writable card-stock. Personalised Save The Date cards are a great opportunity to add a personal touch that will show friends and family who you are and convey your personal flair and creativity. Looking for a fun approach? 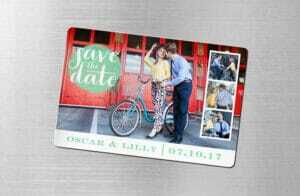 Have you considered sending a save the date photo magnet instead of a card? Choose from a range of pre-built designs or create your own by choosing a layout, design style and adding a personal touch with embellishments. We have dedicated ‘Save The Date’ designs, that are available in Designs > Wedding > Save the date. When planning your personalised wedding invitations, you need to ensure that the theme, look and feel of your wedding is captured throughout. Keeping the look and feel the same completes the aesthetic and makes your special day truly unique. A personal photo of you added to the invitations really adds a special touch that can’t be captured by simply using standard invites. 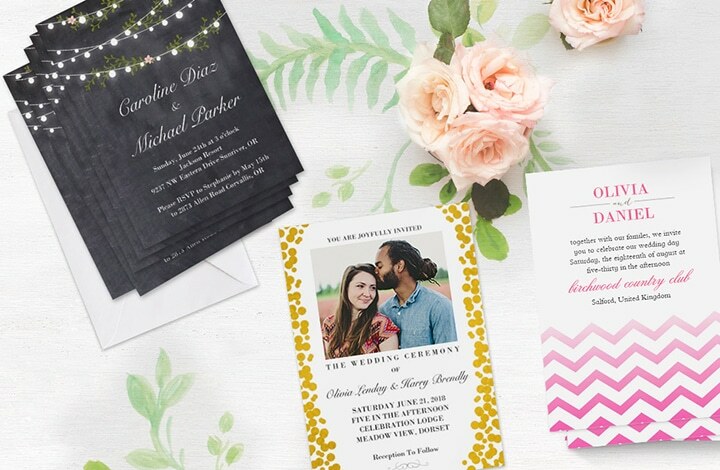 Adding the right photo of you two to an invitation can express more than any amount of words can convey and will truly make your invitation be from the heart. 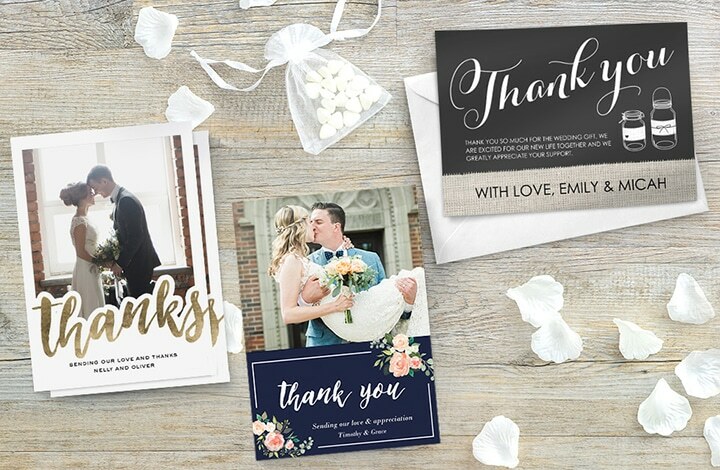 One of the last projects from your wedding is to send out wedding thank you cards and it’s important that you do a few important steps prior to sitting down to write these cards out. Before you indulge in opening up your gifts from your wedding it’s important that you create a list showing who gave you what. This will greatly reduce the chance of embarrassment of missing someone who sent a gift or mixing up who gave you what. Include descriptions like brand names and specific details of each item to help convey your appreciation for the gift and hence connect with those who took the time to share in your special occasion. 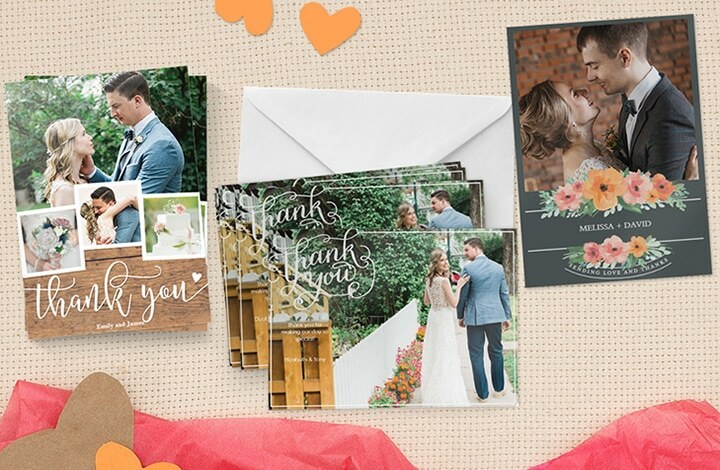 For a truly unique Thank You, have you considered sending a small photo book of the key moments from your wedding to share your thanks with all your guests? Did you know you can now order your 7×5″ flat cards on the Snapfish mobile app! Now you can snap your photos, create your cards AND place your order on your mobile! 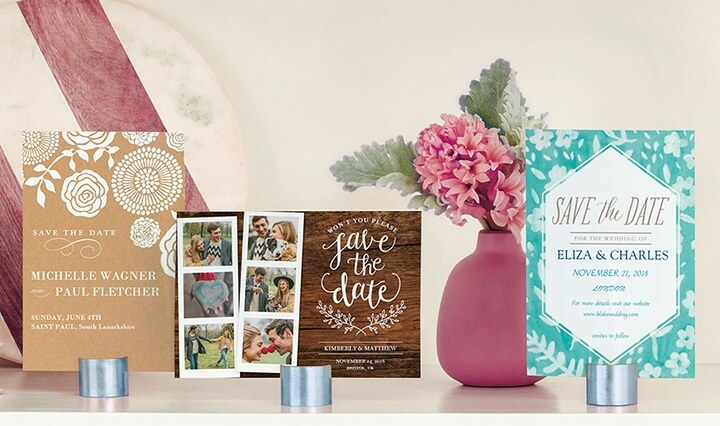 Allowing you to create your Save The Date, Invites and Thank you cards wherever and whenever you’re inspired. Shop the entire Wedding card range. Tagged as personalised cards, Save The Date cards, thank you cards, wedding, Wedding invites.